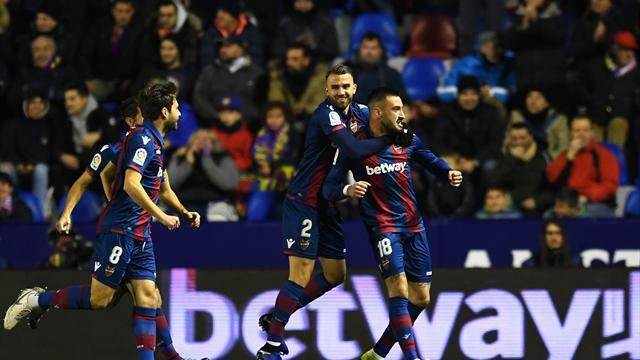 Levante stunned league leaders Barcelona by claiming a 2-1 win to take a slim advantage into next week’s Copa del Rey last 16 second leg. Ernesto Valverde made wholesale changes to his side for the visit to Ciudad de Valencia, with Lionel Messi and Luis Suarez rested and Jeison Murillo handed a debut. The decision to rotate didn’t take long to backfire. Levante took the lead after just three minutes when Erick Cabaco made the most of some slack marking in the box to head past Jasper Cillessen. And it was 2-0 after 17 minutes, with on loan Real Madrid striker Borja Mayoral finding the far corner of the net with a reverse finish. The hosts had chances to extend their lead further, but allowed Barcelona to give themselves a lifeline in the tie when Coke had a nibble at the legs of substitute Denis Suarez in the box. Philippe Coutinho stepped up to convert the penalty and salvage what might have been a disastrous defeat for the Copa del Rey holders. It’s been said for quite some time that Valverde needs to learn to rotate his Barcelona squad more effectively to keep them fresh for more important games later in the season. Well, he did exactly that for this game and found out the dangers of making so many changes. It was clear that large swathes of this Barcelona hadn’t played together. So what is the right way for Valverde to rotate his squad for these sort of matches? Levante’s stunning first half display was defined by the brilliance of both Boateng and Mayoral, who had the vulnerable Barcelona defence all kinds of problems. In truth, they might have done even more damage, giving Levante an even greater advantage heading into next week’s second leg at Camp Nou, but nonetheless Boateng and Mayoral were the standout performers. Boateng probably edged it. Barcelona - Cillessen 7, Semedo 5, Murillo 4, Chumi 5, Miranda 5, Alena 5, Busquets 4, Vidal 5, Malcom 6, Dembele 7, Coutinho 5. Subs - Roberto 5, Denis 6, Lenglet 6. 3’ GOAL! Levante 1-0 Barcelona: What a start for the home side! It was terrible marking from Barcelona, but Cabaco made the most of the space he was afforded in the six yard box to get on the end of the freekick delivery and head past Cillessen and into the back of the net. 17’ GOAL! Levante 2-0 Barcelona: What a mess Barca find themselves in! They are two behind! Boating played in Mayoral, but the on loan Real Madrid striker looked to have been forced too wide. Somehow, though, he sends a reverse shot into the far corner of the net. 62’ Should be three! Mayoral plays in Morales, who was in behind the Barcelona defence. He set himself for the shot, but scooped his finish over the bar when he should have hit the target. 84’ PENALTY KICK TO BARCELONA! Coke has a nibble at the legs of Denis and the referee points to the spot. 85’ GOAL! Levante 2-1 Barcelona: A lifeline for Barcelona! They have an away goal to take into next week's second leg! Coutinho stepped up, his run-up was a stutter-step on, but he squeezes the shot underneath Fernandez in the Levante goal! Big goal for Barca!